Mother-and-stepmother (Tussilago farfara L.) is a wild plant. 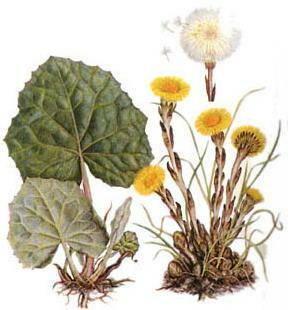 The leaves contain glycoside Tussilago, tanning, mucous membranes and other substances. Infusion (1 tablespoon of leaves in 1 Cup boiling water 1 tablespoon 3 times a day) or broth (15 : 200) accept as an expectorant. The leaves are part of the breast and sweatshop fees. Only the sun starts shining, on the thawed hills on the southern slopes of ravines, ditches and embankments she reveals Golden flowers-the last cent. Leaves yet, they will appear later. Night and in bad weather baskets mother-and-stepmother closed and droop. Remember these places and come here when fade flowers and replace them appears large, angular, unequally, on long stalks with leaves. Below they are light, fluffy and warm, and the top is green, shiny and cold. Hence the name of the plant: the mother-and-stepmother. The leaves are harvested in the summer, in the first half, breaking them up to the middle of the petiole. Be sure that all of them were pure, without rusty spots: infected with rust, must not fall into the collection. Correctly dried leaves are green, bitter taste. Leaves mother-and-stepmother is often confused with the leaves of the burdock, but those oval-rounded form, edge without teeth, and from above they are not so brilliant, and sometimes with the Andromeda tomentose, white and hybrid. Looking closely, you may notice that the list at Andromeda hybrid, for example, though the bottom and grayish-felt, from above rough from small prickly hairs and baskets not with cylindrical shuck, and on the bell-shaped flowers are collected in panicles, and the shields, and not single. Apply leaves mother-and-stepmother in the form of broth when coughing as an expectorant. They are included into the composition of breast and sudoriific teas. Decoctions and infusions leaves mother-and-stepmother is also used in wet bandages, compresses, lotions and baths in the treatment of boils, small ulcers, infected wounds.